JUST IN CASE there was any doubt. As Gujarat economic glitter fades, Modi's posters in Mumbai prepare voters by proclaiming what he really stands for. The storm of opposition is growing against the invitation to Britain of right-wing Indian politician Narendra Modi. There's to be a protest on Monday outside the surgery of Labour MP Barry Gardiner, who has invited Modi to speak in the Commons on "The Future of India". Modi is chief minister of the Indian state of Gujarat, where as many as 2,000 people may have been killed in 2002 in pogroms against the Muslim minority. His bid for premiership of India at the head of the BJP, a party combining right-wing businessmen with fascist thugs and Hindu fanatics, is worrying moderate Hindus, religious minorities and people dedicated to India's traditional claim to secular democracy. There are fears Modi's trips abroad to meet supporters and Western politicians will be used not only to raise campaign funds but to shine up his "respectable" image, suggesting foreign governments are prepared to forget the massacres in Gujarat and let investments come rolling in. But opposition is growing. At Westminster, Labour MP Mike Wood MP has been joined by Respect's George Galloway in an Early Day Motion against Modi's visit to the UK. Reminding MPs and the government of the 2002 slaughter that led to a ban on Modi entering the UK, the motion calls for the ban to be reinstated. (see full text below). Wood, the MP for Batley and Spen, has also written to fellow Labour MP Barry Gardiner (Brent North) to complain that Labour Friends of India, which Gardiner chairs, were not consulted about the invitation to Modi. Brent Trades Union Council has also written to Gardiner, and is backing a protest against the Modi visit. Those in the West singing Modi's praises like to focus on his success on fetching foreign investment and the supposed prosperity and technology it brings, but recent reports from Gujarat concerning corruption and child poverty indicate how little any of that wealth has trickled down. Politically, Narendra Modi and his campaign managers seem to be turning away from mere economics to the theme for which his wing, at least, of the BJP is notorious. MUMBAI: Narendra Modi declaring "I am a Hindu Nationalist" has suddenly become one of the most ubiquitous ad campaigns in Mumbai, hogging space in prominent and highly prized outdoor locations across the city and stoking speculation that the Gujarat CM's upcoming election campaign may emphasise so-called 'Hindu' themes. 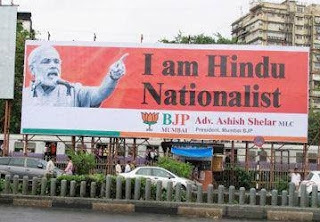 The multi-lingual advertising drive features images of Modi, who is expected to be BJP's contender for the post of prime minister in the next parliamentary elections, alongside various statements he made during a recent, highly publicised interview with Reuters.The campaign is the brainchild of Ashish Shelar, the head of BJP's Mumbai unit. Local BJP leaders told ET there is no wider game plan behind the campaign. The advertising, they claim, is simply an attempt to reflect on a debate that is playing out in the media. Conveniently, it also helps the party get noticed at a time the state assembly is in session. BJP leaders in Delhi claim the Mumbai hoardings are not meant to be a precursor to a nationwide campaign. Shrikant Sharma, in charge of BJP's national media cell, says the state unit is attempting to highlight Modi's 'talking points'. "If state units feel they must acknowledge some of his talking points, they will do so," he says. Senior party general secretary Mukhtar Abbas Naqvi adds that while supporters and state leaders are free to post hoardings and posters, the catchline mentioned is not part of any authorised campaign. "The theme of the campaign is still good governance, and we are designing our campaign to reflect that," he says. Not everyone accepts this explanation. To many who have seen the hoardings, they signal the start of BJP's poll campaign for the 2014 elections. The line itself is evocative of the 'Garv se kaho hum Hindu hain' (Say you are a Hindu with pride) slogan coined during the Ramjanmabhoomi-Babri Masjid movement of the early 1990s. Party leaders admit there is likely to be merchandise with slogans like 'Do you want your country Modi-fied?' on T-shirts, caps and key chains, all coloured in a saffron hue. In Karnataka, some of this merchandise is already up for sale. According to KV Sridhar, chief creative officer at Leo Burnett, the agency that created the 'Aam aadmi ko kya mila' campaign that is credited with having brought the UPA to power in 2004, "Narendra Modi is making a transition from being seen as a growth agent to being considered primarily a Hindu nationalist. The three statements he has made - about puppies (in reference to the Gujarat riots of 2002), being a Hindu nationalist and that Congress is wearing the burqa of secularism - are not coincidental. He's appealing to the masses, and that is the only mass appeal platform the party has." "We tell our brands if you can't correct your weakness, play on your strength. BJP's weakness is secularism and its strength Hindutva. They have chosen the one plank Congress cannot attack them on. India may have changed a lot, but it is still a predominantly Hindu country," believes Sridhar. Modi's return to his party fundamentalists and Hindutva has alarmed the more moderate members of the BJP such as those in Goa where there is a Christian electorate. But as Modi pauses his visit to sort out his party, he has continued to enjoy support from Barry Gardiner who in interviews rounded angrily on the BNP leader's Indian critics. In 2001, when Barry Gardiner proudly presented a cheque for earthquake relief in Gujarat he could be forgiven for not knowing those accepting this were officials of Hindu supremacist outfits who, according to critics, made sure the funds passed on through sectarian channels. Besides this was the year before the Gujarat pogroms which left little space for innocence. The Brent North MP has continued to defend Modi against opponents, and stressed the importance of British investments in Gujarat. This is not just a matter of Gardiner's views or relationship to Gujarati Hindu voters in his constituency, who might well resent their political allegiance being assumed from their religion or ethnicity. There has been an orchestrated pro-Modi campaign at work organised by professional lobbyists. If Barry Gardiner cannot bring himself to break from such company, the Labour Party in Brent must be prepared to divest itself of Barry Gardiner. That this House calls on the Secretary of State for the Home Department to reinstitute the ban on Gujarat's Chief Minister, Narendra Modi, from entering the UK, given his role in the communal violence in 2002 that claimed the lives of hundreds if not thousands of Muslims, including British nationals; expresses its concern that the ban was lifted for economic and diplomatic reasons, ignoring the role Mr Modi and his administration played in the violence that warranted the ban that stood for more than 10 years; notes that Mr Modi was previously denied a visa on grounds that he was 'responsible for or directly carried out... particularly severe violations of religious freedom'; and calls on Mr Speaker and the House authorities to ban Mr Modi from entering the Palace of Westminster.